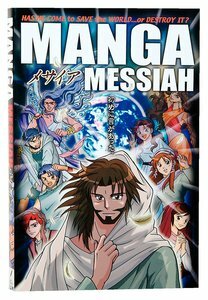 About "Manga Messiah : Has He Come to Save the World...Or Destroy It? (The Gospels) (#01 in Manga Books For Teens Series)"
Customer Reviews For "Manga Messiah : Has He Come to Save the World...Or Destroy It? (The Gospels) (#01 in Manga Books For Teens Series)"
The story is accurate and parallel to the Bible. The artwork is amazing. The dialogues and expressions are just wow. What more can I say? Definitely recommend it to kids, teens or even adults who are comic book or manga fans, and would like to see stories from the Bible told with great pictures and diaogue to help with explaining things further. Greatest Comic version of Jesus! This is my favourite "comic" version of the New Testament so far! I love the Japanese manga style and the expressions of the characters as the story is told. I think this is great for all ages and can be used for personal study (along with the Bible) or given as a gift. I think this is by far the best of the Manga M... series. It's an adaptation of the gospels based on a harmony. It seems to stick closely to the biblical text. I can't figure out which version it is based on (I suspected the NLT given that the publisher is Tyndale, but this is not the case) but anyone familiar with the gospels will certainly recognise how closely the publishers have kept to the text. The chapter and verse references are given at the bottom of the page, so it is very easy to flip to the same passage in a Bible. Equally impressive is how of Jesus' teaching and parables are included. Many comic book Bibles will do narrative will but stumble over what Jesus taught. This one doesn't. Occasionally the  explanatory notes are clunky (see p.71 for example) but on the whole, the text is smooth. The illustrations are colourful and very appealing. Great tool to introduce someone to Jesus, for whom, even reading through Mark would be a stretch. This is possibly the best "comic" Bible I have ever read. The art work is beautiful, the emotion in the characters really works. (In fact, in places I was in tears over the beauty in the expressed emotion of the apostles!). This is a must for people who are "into" anime/manga (like myself), for young people, and just as an alternative way to outreach.